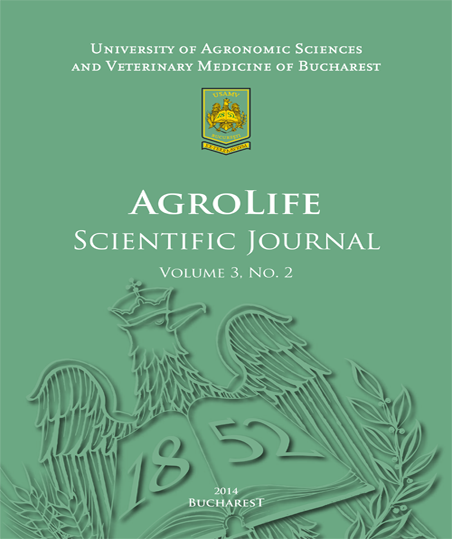 The AgroLife Scientific Journal is a multidisciplinary, single blind peer-­reviewed, full access journal that will be published biannually by the University of Agronomic Sciences and Veterinary Medicine of Bucharest. The journal welcomes the submission of original research papers and reviews that meet the general criteria of significance and scientific excellence. AgroLife Scientific Journal is aiming to present the latest developments on subjects covering agronomy and life sciences field as a whole: Agriculture, Horticulture, Animal Science, Biotechnology, Veterinary Medicine, Environmental Science and Engineering, Management and Engineering in Rural Areas, encouraging the interdisciplinary and cross functional issues. We invite you to submit your manuscript for publication. The journal is issued twice a year, in June and December. The Journal publishes scientific articles both in print and online volume (print ISSN 2285-­5718, online ISSN 2286-­0126), and is indexed in international databases. For the June issue, the full papers will be submitted until March 15, and for the December issue, until July 15. After the submitting deadline, the articles are verified according to the Authors Guidelines requirements. The authors are informed through e‐mail about the results of the assessment within 15 days from the submission deadline. Eligible articles are submitted to single blind peer review, that last 30 days, authors also being informed about the results at this stage.